GPX or GPS eXchange Format (GPS exchange Format) is an XML scheme designed to transfer GPS data between applications and online Web services. It can be used to describe points (Waypoints), tracks (tracks), o routes (routes). It allows exchange between a large number of programs for Windows, MacOs, Linux, Palm and PocketPc. It can convert into any format being used by a website or application. 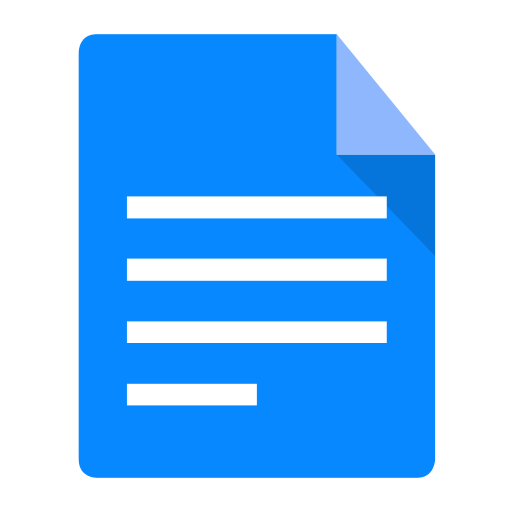 It is based on the XML standard, which is why so many widely-used programs can read GPX files. It allows the development of new features for using data from GPS receivers. Here, the steps to follow for transferring GPX files using G7ToWin and EasyGPS will be described. 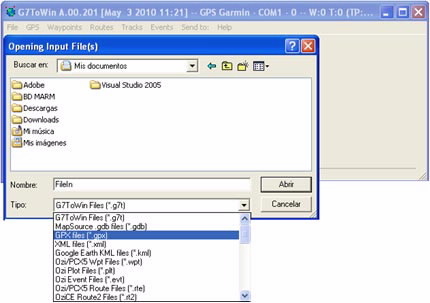 G7ToWin is an executable programs that allows you to introduce files in GPX or GPS format and convert GPS data to GPX format. G7ToWin Standard: is a standard version. G7ToWin 64 bit: is a more modern version of the program. G7ToWin without USB: this version is used for insertion into a USB port. The software is compatible with Windows 95, 98, Me, XP, Vista. If you have a computer with another non-Windows operating system, one of the programs that you can use is GPSBabel. Installation is very simple, just download the correct version and decompress it into a PC directory. Since it is an executable file, it is not necessary to install it on the computer, just execute the g7towin.exe file and the program will open. Some of the GPS devices that are compatible with G7ToWin are: Garmin, Eagle, Lowrance and Magellan. On the Turgalicia website there are points of interest files available to download in GPX format. This format is applied to the G7ToWin program, following the process described below. 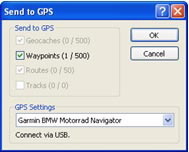 Connect the GPS to the computer using a USB cable. The GPS is configured in the option: File Configuration. A new window will appear where in the general tab you must assign the GPS, the USB and the speed. 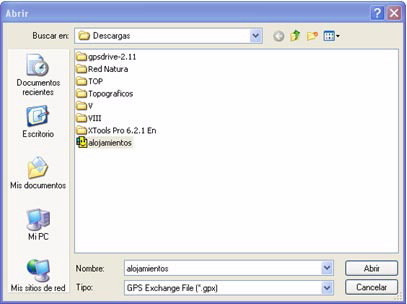 Downloading GPX files: Decompress and save the GPX files information from the Turgalicia website in a locatable place on the computer. Loading points of interest: Once the program is installed and you have checked that the GPS configuration is correct, you can incorporate the POI into the program. This is done from the main menu: File Open. Once the POI are loaded onto the GPS you can close the program and unplug the GPS from the USB cable. When the GPS is switched on, the POI will appear. The EasyGPS lets you transfer waypoints and routes from the computer to the GPS device. 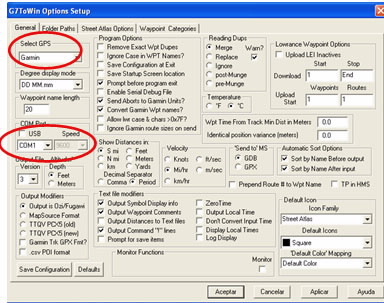 EasyGPS only works with Windows Vista and XP operating systems; and it only transfers data with .gpx or .loc extensions. GPS devices compatible with EasyGPS: Becker, BlackBerry, Brunton, Cobra, DeLorme, Eagle, Furuno, Garmin, Holux, HTC, Humminbird, Jensen, Lowrance, Magellan, Medion, Mio, MLR, Navigon, Navman, Nextar, Nokia, Pharos, Satmap, Silva, Sony, Thales and Tom Tom. On the Turgalicia website there are points of interest files available to download in GPX format. This format is applied to the EasyGPS program, following the procedure described in this tutorial. 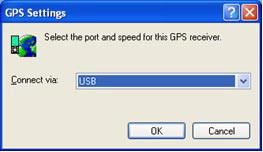 Once the program is installed, connect the GPS to the computer using a USB cable. 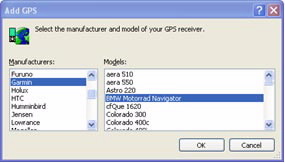 When you open the EasyGPS application, it will ask you about the GPS receiver, in order to assign the GPS type and model. Click on Add GPS. When you click OK, another window will appear where you assign the GPS connection method, for example USB. Loading the POI: To enter the GPX files in the program click on File, Open. Search for the downloaded .gxp files. Once the file is opened, it will appear in the lower part of the program. A menu will open where the number of points to be sent and the GPS model and type are listed. If everything is correct, click on OK.
Or, from the send icon ( ). In this case, a window will also appear with the information to be sent. If everything is correct, click on OK.
Once the procedure is completed, you can disconnect the GPS. Once the GPS is switched on, the points of interest will be included on the device. 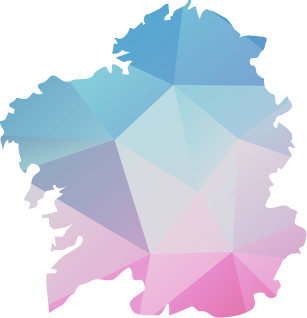 The GPSBabel program allows for the conversion of more than 140 file formats to be able to work with them in different programs for editing and processing geographical information and different GPS receiver models.